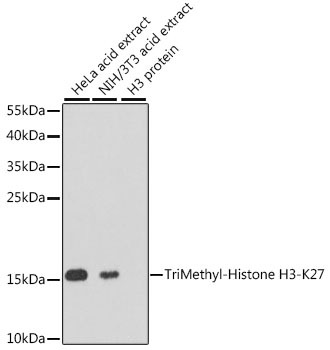 Western blot analysis of extracts of HeLa cell line and H3 protein expressed in E.coli., using H3K27me2 Dimethyl Polyclonal Antibody. Dot-blot analysis of all sorts of methylation peptides using H3K27me2 Dimethyl Polyclonal Antibody. Immunohistochemistry of paraffin-embedded rat lung tissue using H3K27me2 Dimethyl Polyclonal Antibody at dilution of 1:200 (x400 lens). Immunohistochemistry of paraffin-embedded human kidney tissue using H3K27me2 Dimethyl Polyclonal Antibody at dilution of 1:200 (x400 lens). Immunohistochemistry of paraffin-embedded human lung cancer tissue using H3K27me2 Dimethyl Polyclonal Antibody at dilution of 1:200 (x400 lens). Immunohistochemistry of paraffin-embedded human liver cancer tissue using H3K27me2 Dimethyl Polyclonal Antibody at dilution of 1:200 (x400 lens). Immunofluorescence analysis of 293T cell using H3K27me2 Dimethyl Polyclonal Antibody. Blue: DAPI for nuclear staining. Chromatin immunoprecipitation analysis extracts of 293 cell line, using Histone H3K27 Dimethyl Polyclonal Antibody and rabbit IgG. The amount of immunoprecipitated DNA was checked by quantitative PCR. Histogram was constructed by the ratios of the immunoprecipitated DNA to the input. Modulation of chromatin structure plays an important role in the regulation of transcription in eukaryotes. The nucleosome, made up of DNA wound around eight core histone proteins (two each of H2A, H2B, H3, and H4), is the primary building block of chromatin. The amino-terminal tails of core histones undergo various post-translational modifications, including acetylation, phosphorylation, methylation, and ubiquitination. These modifications occur in response to various stimuli and have a direct effect on the accessibility of chromatin to transcription factors and, therefore, gene expression.In most species, histone H2B is primarily acetylated at Lys5, 12, 15, and 20. Histone H3 is primarily acetylated at Lys9, 14, 18, 23, 27, and 56. Acetylation of H3 at Lys9 appears to have a dominant role in histone deposition and chromatin assembly in some organisms. Phosphorylation at Ser10, Ser28, and Thr11 of histone H3 is tightly correlated with chromosome condensation during both mitosis and meiosis. Phosphorylation at Thr3 of histone H3 is highly conserved among many species and is catalyzed by the kinase haspin. Immunostaining with phospho-specific antibodies in mammalian cells reveals mitotic phosphorylation at Thr3 of H3 in prophase and its dephosphorylation during anaphase. Histone H3K27me2 (H3K27 Dimethyl) Polyclonal Antibody. Unconjugated. Raised in: Rabbit. Mahan AL et. al. (March 2012). Epigenetic modulation of Homer1a transcription regulation in amygdala and hippocampus with pavlovian fear conditioning. J Neurosci. 32(13):4651-9.